Key Lime Pie is one of the easiest pies to make (you don’t even need to get out the mixer for this recipe) and to me, it’s one of the best! I like it all year long, even in the dead of winter. You can save some time and use a pre-made crust and whipped cream from the can, but don’t skip the fresh lime juice! I use Key Limes if I see them in the store, but typically I use regular limes. 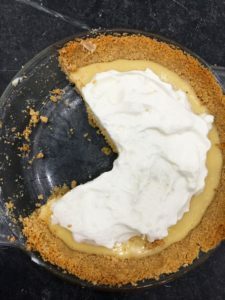 To make the crust, stir together graham cracker crumbs, sugar, and melted butter in a bowl until combined, then firmly press mixture into a 9-inch pie plate. Bake crust for 10 minutes, and let it cool while you make the filling. Leave the oven on. Whisk together sweetened condensed milk and egg yolks in a bowl until combined. Add lime juice and whisk until combined well (mixture will thicken slightly). Pour filling into crust and bake for 15 minutes. Cool pie completely on rack (filling will set as it cools), then chill, covered, for at least an hour (overnight is fine). Just before serving, top pie with whipped cream. *TIP: For the topping, you can use fresh cream whipped with a little vanilla, or just grab the real stuff from the can (or Cool Whip if that’s your thing). I like to spread it out in the middle of the pie so it looks really rustic and homemade. Copyright © 2016 Our Everyday Dinners - This is an easy recipe for how to make Key Lime Pie.